From a children’s hospital in Egypt to a military hospital in China to a cancer treatment center in Flint, Michigan, CallisonRTKL designs hospitals all over the world. 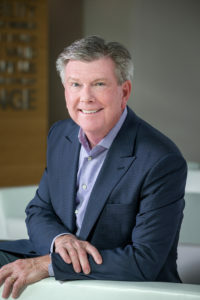 CallisonRTKL Executive Vice President and Global Practice Group Leader Brad Barker oversees the company’s healthcare division, focusing on ways to make hospitals ever safer and more efficient and patient-friendly, wherever they are. He also faces the specific challenges of working internationally. He shared with Global HealthCare Insights his tactics for meeting the international demand for designs that meet U.S. standards while managing the various risks and obstacles that can be part and parcel of working globally. What are some of the challenges of building hospitals internationally? On the international side of our business, it’s hard to get paid. That’s never a problem in the U.S. The Middle East is probably where I’ve had to spend the most time trying to get paid. We’re doing a big hospital in Egypt. They’ve owed us money for a year, and now they owe us a significant amount. We’ve stopped work on it, that’s what you have to do sometimes to get paid. We’re at a point where we’re pulling out of the Middle East. Business there is drying up as a result of oil prices dropping. Getting paid is a problem in Asia, too. We have a hospital in China that was built exactly the way we planned and designed it. They still owe us a lot of money. We’re going after them with a lawsuit. And having your ideas stolen is the real issue in China. You can’t really do a financial audit in international markets, and so what we have to do now to protect ourselves is saying that you’ve got to pay us a 15-percent mobilization fee up front before we do anything. That way we basically get cash in the door before we start the work, and then once we burn through that we stop and say “OK, I need to get more money or I can’t finish the job.” That way we’re never behind on payment, whereas if we start the job and we don’t get that mobilization fee, we’re always in a hole. We also no longer accept contracts that pay us by phase, we have to have monthly billings. It’s a struggle to get international clients to do that. And we typically delineate in the contract what interactions clients can expect — you get five meetings, and two of them are face-to-face, three of them are on Skype, and so forth. A lot of things that we kind of just left loosely spelled out in the old days, we can’t do that anymore. We’ve got to be be more careful. Do the approaches you use to design in the U.S. apply elsewhere? Some of the design challenges are the same anywhere. A hospital is a building that’s open 24 hours a day, 365 days a year. And there are a lot of safety requirements because the building is sustaining lives. The redundancy has to be pretty deep, you can’t take anything for granted. If you’re having open-heart surgery and there’s a power failure, there has to be a generator that immediately kicks on, and another one sitting right there ready to kick on if the first one doesn’t work. Every building is a unique challenge in functional efficiency, too. How can I reduce the steps of the staff? How can I allow the caregiver to spend more time with the patients? Consumers have a choice nowadays, they get to pick where they want to go. Healthcare is trying to be a little bit more attuned to what the consumer is looking for. International markets see the U.S. as offering the best care in the world, and they want us to bring them Western ideas. The building has a lot to do with winning over patients. It starts with whether parking is a stressful experience. I canceled my orthopedic appointment at a big hospital here in Dallas this morning because I couldn’t find a place to park. There’s fear and trepidation among many patients, and if the building is agitating that anxiety, it really creates an unhealthy environment. So we’re trying to calm people down and help them feel less stress. When you work internationally, do you form partnerships? Oh, yes, you need a local partner firm. For instance, in the Middle East, the drawings that the contractor uses to build the building need to be in Arabic. Same thing in China, they’ve got to be in Chinese. You typically always have a local partner on international work, because they know the trades and how contractors build buildings in their markets better. We don’t really have that knowledge. We are pretty much importers of intelligence on international projects. What are the regulatory hurdles like? You always have to interface with governmental agencies on international projects. In Saudi Arabia, for example, most of the hospitals are government-owned, with specific rules and regulations. But it’s not that difficult to deal with, because most of the regulations are founded on Joint Commission standards, and the client wants to make good use of what you know about meeting those standards. In China, they’re not asking you to design it to some standard of their own, they want it designed to U.S. standards. What are some of the coming challenges in hospital design? It’s clearly about technology, and that’s changing the demands on facilities. Laboratory equipment has advanced. All the medical gasses needed in patient rooms are now built into the building, which is expensive — you’ve got to run the piping and have all the safety controls. Now there’s talk about building all that into the beds instead of the building, so that the bed can be mobile and take everything with it. Minimally invasive surgery procedures have completely changed surgery. You used to go to the hospital and stay for a week, now you’re going in and staying for the afternoon. You’re no longer putting surgical patients in a patient room, and that’s changing in-patient volumes. Genome therapy is going to be the next wave. It will replace some of the big, long surgical procedures. All this means you won’t need as many big hospitals. Reena Karasin is a journalism intern at GHCi.